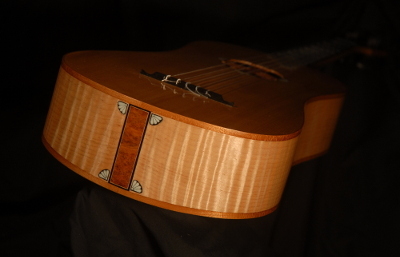 This example has Soft Curly Maple neck, back, and sides. The top is 100 year old Red Spruce. The binding, fingerboard, tuning pegs, and bridge are ebony. 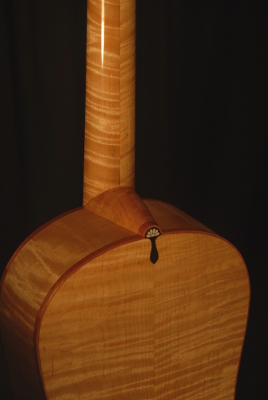 The headstock is faced with an ebony-maple-ebony veneer. 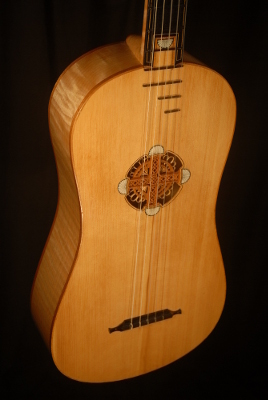 The tuning for this guitar is Aa/D/G/b/e and is strung with very low tension strings which is typical of baroque guitars which are very lightly constructed. Other tunings are common on this type of instrument as well.